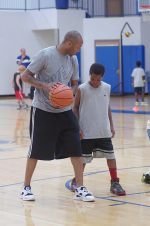 Do you have specific youth basketball questions, suggestions, or comments related to the information on this site? Do you have some great basketball drills, fun games, or pictures of your "little all-stars" that you'd like to share with us? Do you know of excellent camps or leagues that we could share with others? Are there any topics you are particularly interested in that you would like to see covered? I would love for this website to be a helpful resource for parents, coaches, and players. If you've got something to contribute, please let us know.